PumpkinPatchesAndMore.org - Find a pumpkin patch, corn maze, safe trick-or-treating, hayrides and other Fall and Halloween fun near you! How to Make Homemade Pumpkin Cookies! Pumpkin cookies are a great change from chocolate chips and other cookies, as they are much more nutritious, as well as tasty! The taste is reminiscent of pumpkin pie and they're great warm from the oven or warmed later in the microwave! They have a light, soft, almost bread-like texture! and of course, you can add orange food coloring to the icing and use frosting to make jack-o-lantern faces or other designs on them, too! Perfect for Halloween, Thanksgiving or Christmas and holiday parties. Preheat oven to 375 F (190 C). 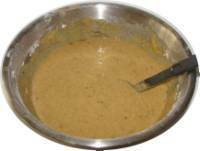 Carefully, lightly brown the 6 tablespoons butter or margarine in a saucepan over medium-low heat. Be careful not to burn it. If you have trouble getting it to brown, down worry about it, it is mostly to add the color! Remove the browned butter from heat. 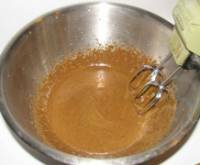 Blend in the confectioners' sugar and the vanilla extract. It will start off think and lumpy, until you add the milk in the next step. Mix in just enough milk to make the mixture smooth and spreadable. It probably will only take a small amount, like 1/8 to 1/4 cup. Now set the icing aside. 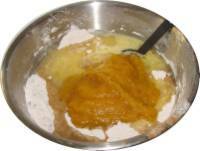 In a large mixing bowl, mix the butter and brown sugar together until light and smooth. Mix in the eggs, pumpkin and vanilla extract. 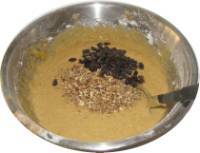 In a separate bowl, stir together the flour, baking soda, baking powder and spices (cinnamon, allspice, ginger and nutmeg). Stir in the chopped nuts (optional). Use a ordinary spoon (table, soup) or small ice cream scoop to drop the cookie dough onto the greased cookie sheet (you can also use the silicon cookie sheet cloths on a regular cookies sheet, the cookies will come off more easily). Bake pumpkin cookies in the oven for 10 to 15 minutes, or until lightly browned. Spread the butter icing on them! They're great warm, or later when cool! 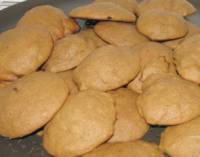 A visitor writes on September 13, 2014: "The pumpkin cookie recipe is my absolute favorite. I found this site trying to figure out how to cook a pumpkin, and got an amazing recipe too! These cookies are perfect for fall. They kind of have a muffin texture, which I love, because I can't stand crunchy cookies. They're so fluffy and soft. Whenever I make them, they never last long. I almost never need tupperware to store them because they get eaten right off the pan. The pumpkin cooking page is really helpful. I usually cook pumpkins every fall, freeze it, and use it for the cookie recipe year-round. The recipe has a lot of ingredients and takes so me time to make it - but is entirely worth it. Especially if you make it in bulk and freeze it for later. I'm all about having cookies for guests whenever they come over, and these are guaranteed to please. The cookie itself isn't that sweet, but the icing is, and they make a great pair. " A visitor writes on November 02, 2013: "I really want to thank you for the pumpkin cookie recipe. 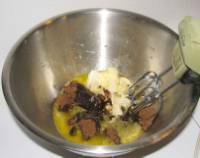 About 5 years ago I was looking for a non-typical, unsweetned recipe. I wanted something more wholesome and I found the recipe on this site. I haven't made it often, but I refuse to use another. My pre-teen nephew at the time, and my young boys loved the cookies. I remember eating the cookies with steamed fish and it went well. Cookies and fish, an unusual dish. Fun for kids, and works because this is not a sweet cookie recipe. I was in New York then and I can't find the copy that I had so I looked you up again. Glad I found it. I'm going to try making the cookies using the fresh pumpkin recipe. The PDF pages help a lot. Thank you!" This is the same type of standard canner that my grandmother used to make everything from applesauce to jams and jellies to tomato and spaghetti sauce. This complete kit includes everything you need: the canner, jar rack, jar grabber tongs, lid lifting wand, six pint jars with lids and rings, a plastic funnel, labels, bubble freer, and the bible of canning, the Ball Blue Book. You'll never need anything else except more jars and lids! Click here for more information, other strainers and supplies or to order! With the Deluxe Food Strainer/Sauce Maker, you can make creamy apple sauce and smooth tomato sauce without having to peel and core! This muli-use strainer forces food through a stainless steel screen, automatically separating the juice and pulp from the seeds, shins, and stems. Perfect for purees, creamed soups, baby foods, pie filling, juices, jams, and more. Save time, effort, and money by preparing your own tasty sauces to be used immediately or boiled for future use. Do bushels with ease and in a fraction of the time. Includes the tomato/apple sceen with easy twist on design and instruction/recipe booklet. Can't find the equipment? We ship to all 50 states! Just email us!